© 2019 Grief SN, et al. This is an open-access article distributed under the terms of the Creative Commons Attribution License, which permits unrestricted use, distribution, and reproduction in any medium, provided the original author and source are credited. Obesity is an American epidemic, affecting 35% of US adults, and 17% of US children . These rates of obesity are above the Healthy People 2020 targets of 30.5% and 14.5%, respectively . Obesity is defined as a Body Mass Index (BMI) ≥ 30 kg/m² . Obesity costs hundreds of billions of dollars to the health care system annually, is associated or directly related to 60% of type 2 diabetes and is a well-recognized risk factor for high blood pressure, heart disease and stroke [3,4]. 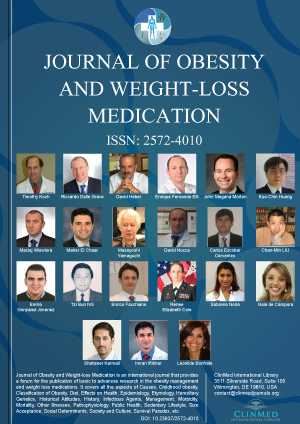 This article will review the causes, screening recommendations, and roles of diet, exercise, lifestyle counseling, pharmacotherapy and bariatric surgery related to obesity and its management. A simple overview of obesity management can be seen in Figure 1. Dr. Samuel N Grief, MD, FCFP, FAAFP, Professor, Clinical Family Medicine, Department of Family Medicine, University of Illinois at Chicago, 1919 West Taylor Street, Suite 143, Chicago, IL 60612, USA.